The town of Tottenville is located at the southern tip of Staten Island, and many Native American artifacts and burial sites have been found in the area; it is believed that Delaware (Lenape) Native Americans originally inhabited this part of the island. In September 1776, the British Lord Admiral Richard Howe (1726-1799) made a last-minute attempt to avert war with the colonists by inviting Benjamin Franklin (1706-1790), John Adams (1735-1826) and Edward Rutledge (1749-1800) to Staten Island to discuss a possible compromise. No agreement was reached, however, the 17th century stone manor in which the conference was held still stands at the foot of Hylan Boulevard. It is now called Conference House, and is administered by the Historic House Trust of New York City. Founded in 1989, this trust works in partnership with Parks to enhance and promote preservation and public appreciation of historic house museums on park properties throughout the city. The entrance of Tottenville Pool is located two blocks from Raritan Bay, on the corner of Hylan Boulevard and Joline Avenue. Though the pool’s official name is Tottenville Pool, some local residents call it Joline Pool. The Totten and Joline families were, in fact, connected by marriage. The Board of Estimate assigned the first .918 acre of this site to Parks in 1970 and 1971. Thirteen years later, an adjoining .459 acre was assigned to the Department of Real Property. In 1993, a $22,000 grant from the City Parks Foundation funded the opening of the playground next to the pool. 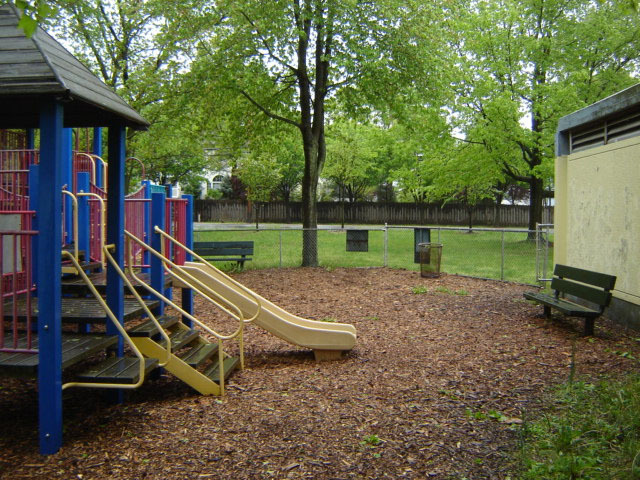 The play area is covered with wood chips and includes several slides, benches, and a jungle gym. Though the pool is only open seasonally, the playground remains open year round.